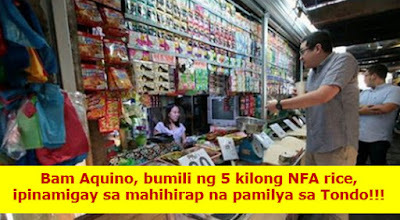 Senator Benigno “Bam” Aquino IV bought five kilos of NFA rice, and gave them to the poor families in Baseco compound in Tondo, Manila. The Liberal Party (LP) visited the area on Tuesday, April 3, and checked the current prices of rice have increased due to the implementation of the Tax Reform for Acceleration and Inclusion (TRAIN) law. “Nagulat nga po ako, kasi sa dami-dami ng tindahan dito sa amin, sa akin pa naisipang bumili ng bigas si Sen. Bam Aquino. (I was surprised that despite the fact there are a lot of stores in our area, Sen. Bam Aquino chose to buy rice from me. )” The sari-sari store owner who only identified herself as Eloisa said, adding that the senator was very kind. Eloisa said that Sen. Aquino bought 5 kilos of NFA rice, for P35 per kilo, noting that the latter gave her P200 and did not get the P25-change. She said that he heard the senator telling his aides to find the poorest among the poor families in their place, and to give the rice to them. Later, he released a statement on his observation of the NFA rice. "Lalong tataas ang presyo ng bigas ngayong ubos na ang stock ng NFA Rice. Hinahayaan lang ng NFA na lumaki ang problema na dulot ng kanilang kapalpakan. Dapat lang na palitan na ang NFA administrator at magtakda ng bagong pinuno na may kakayahang solusyunan ito." Sen. Bam Aquino said on his Facebook page. Sen. Bam Aquino also criticized the Duterte administration for the supposed negative effect of the TRAIN law, especially to the poor families. He emphasized that the increase of prices of prime commodities is very alarming, and Congress should determine the real and actual impact of TRAIN on the country’s economy.